You can save up to $3300 on an Antarctica cruise on the G Expedition for this coming season with their great March deal. Save up to 15% off regular prices for their range of Antarctic voyages to the Antarctic Peninsula, Antarctic Circle, or their longer combination trips to the Falkland Islands, South Georgia and Antarctic Islands or Spirit of Shackleton journeys. Different discounts apply for different cabin types and departures and are highly subject to availability. 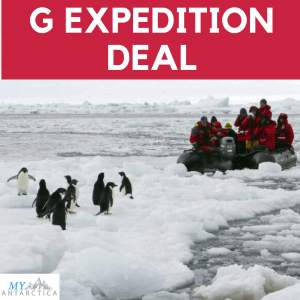 The G Expedition Deal ends on 31 March 2017 and at these prices, spaces are sure to go quick so contact a polar specialist to see which departure is best for you ASAP! The G Expedition is an economical Antarctica option catering for guests in a range of cabin types and across a number of different Antarctic routes, perfect for those seeking the ultimate adventure on a budget. To see all itinerary, cabin and G Expedition ship details, or even request availability please visit the product page here. Save between 5 and 15% on selected cabins and departures of the Antarctica Classic cruise. Save up to 5% on select cabins and departure dates on Antarctica Classic in Depth Voyages. Save up to 15% on selected cabin types and specific dates for extended Antarctica cruises on the G Expedition. Save up to 15% off specific departure dates on Quest for the Antarctic Circle voyages on the G Expedition. Save up to 5% off select cabins and Quest for the Antarctic Circle departures. Save up to 5% of specific cabins and departures of the Spirit of Shackleton adventure on the G Expedition cruise. To see all itinerary, cabin and G Expedition ship details, or even request availability please visit the product page. For help deciding which Antarctic cruise is for you, speak to an expedition specialist.